Animal Friends would like to invite you to the promotion of the book The Livewire Guide to Going, Being and Staying Veggie!. The promotion will take place on Thursday, January 17, 2002 at 5 A.M. in the MAMA club on Preradoviceva ulica 18. 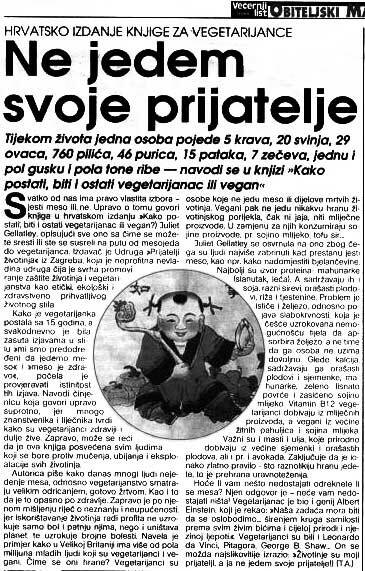 Animal Friends is proud to be the first to publish the Croatian translation of the book The Livewire Guide to Going, Being and Staying Veggie! by Juliet Gellatley - a distinguished British activist for animal rights and vegetarianism, and the founder of the VIVA! organization (Vegetarian International Voice for Animals). This brilliant book is the result of 15 years of research on the raising and killing of animals for human consumption, as well as a research on vegetarianism. The book also contains a lot of information on ecology, health, diet and the raising of animals in the meat industry. Thursday, January 17 at 5 A.M. in the MAMA club on Preradoviceva ulica 18, Animal Friends will be holding a promotion of the Croatian edition of the book and a 20-minute long movie called "Devour the Earth" by Paul McCartney and the Vegetarian Association of Great Britain will be shown. "This book will take you through the change from being a meatie to a vegetarian - every step of the way. Every question answered, every doubt knocked on the head and every concern sorted. If you're already a veggie, this book will give you the confidence and knowledge to argue for your beliefs. If your parents are worried, it will put their minds at rest. If you're short of facts, you'll find them here.